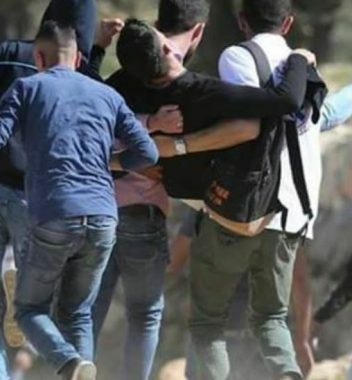 Israeli soldiers shot, Friday, nine young men with live fire and rubber-coated steel bullets, after the army invaded the al-Mazra’a al-Gharbiyya village, northwest of Ramallah, and attacked Palestinian protesters. Palestinian medical sources said five young men were shot with live fire, and four with rubber-coated steel bullets, while many more suffered the effects of teargas inhalation. The Palestinians were holding the weekly nonviolent procession against the illegal Israeli colonies and Annexation Wall, especially against a recent decision illegally confiscating more of their lands. Many youngsters hurled stones at the soldiers, who fired more live rounds, rubber-coated steel bullets, gas bombs and concussion grenades.